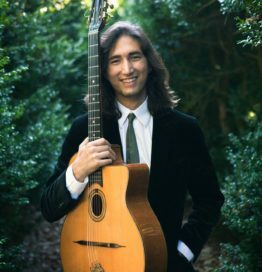 Luca Pino has been making the trek from his hometown of Long Beach, CA to Django in June for several years now and every year he shows up an even better, more seasoned player. He couldn’t get any nicer, so in that regard he hasn’t progressed at all. He first joined our teaching staff—winning rave reviews—in 2017 and we’re happy to have him back in that capacity again. Luca’s highlights from 2017 included taking the stage for the first time at Djangofest Northwest, with the Eric Vanderbilt All Stars. He also played the Walt Disney Concert hall with Postmodern Jukebox for New Years Eve, which doubled as an audition for Dancing With The Stars. I think he can take it. When not dancing the light fantastic Luca spends time learning impossibly challenging solo guitar pieces by the likes of Benoit Convert. Jeesh.